I was having a chat with some colleagues in New Zealand (who shall remain nameless, but you know who you are PJ & KA) about Encounters – specifically how to model an encounter (using openEHR archetypes as it happens), and it became evident that we were talking about slightly different things by the word ‘encounter’. I was referring to the FHIR encounter – a resource that has mainly administrative information about a contact with a patient (date, time, participants and so on), but my colleagues were referring to the more holistic concept of encounter – including all the clinical information collected during that encounter, actions performed, and so on. So that we were talking about the same thing, I volunteered to write down how you could express these concepts in FHIR – so here it is. A simple Primary Care (Ambulatory Care in the US) consultation, which has a clinical note (subjective and objective) plus a prescription. Note that I’ve used a Composition resource to establish the context of the Consultation note. This is a versatile resource (as most of them are in truth), which is also used in a FHIR document, although it doesn’t have to be – as this example shows. The composition references the encounter, and also – through the sections of the composition – the clinical findings and actions that occurred during the consultation. There is some duplication of data – eg dates are in both encounter and composition – but nothing to get too concerned about. This is how you could store the record in a data store, and of course it’s really easy to serialize into a FHIR document if you want to send a copy of the record to someone else – it would be an atom feed with 7 entries/resources in it with the appropriate references (see an example of a similar FHIR document here). 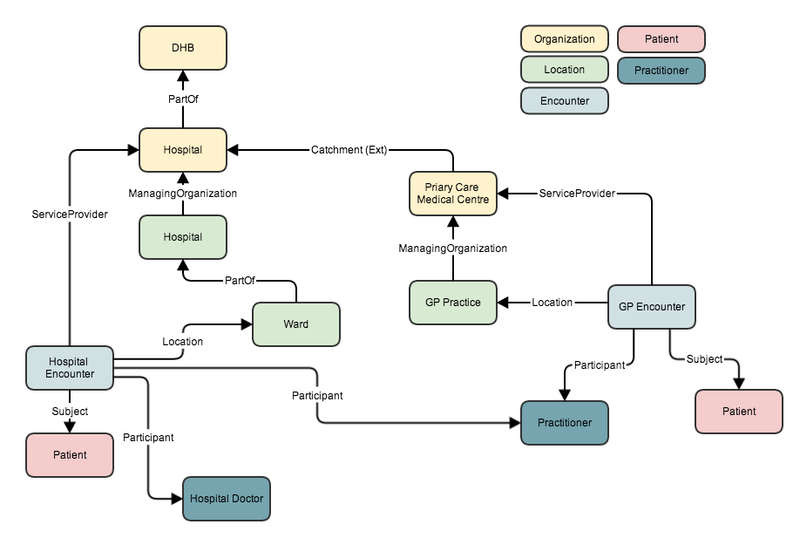 Of course, you would also need to include copies of the referenced resources like Patient and Practitioner (that I left off the picture for simplicity) that would increase the resource count slightly. 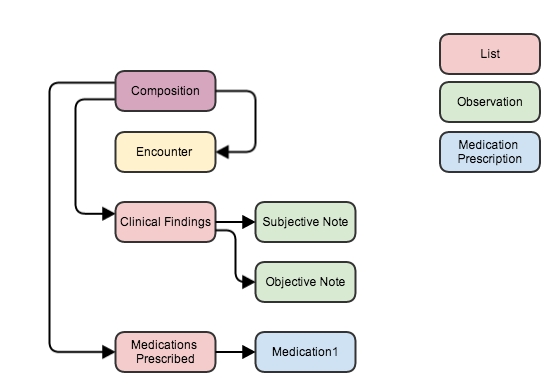 So: in our modelling work we really need to model the Encounter as a separate Entity with references to the clinical parts of the consultation, rather than a single model that seeks to encompass the whole thing (IMHO). One of the tasks I’ve been given here at Orion is to look at our internal data stores, and see how we could create a FHIR based service layer that would allow external (and internal) consumers to interact with that store. I started with the Encounter service, and things went pretty well – but I realized that if this was to make sense to other BA’s (Business Analysts) and Developers then I needed to draw the bigger picture – how the resources would relate to each other when representing an encounter – it’s not quite as simple as it might seem! The biggest change in thinking is going to be thinking in terms of multiple resources. If we want to retrieve the details of a single encounter, then we’re not going to just call the service and get back a single object that represents the encounter and all the properties of that encounter – rather we’re going to get back an ‘object graph’ – a number of resources related to that encounter contained within an atom bundle. The client could request that the server return the referenced resources by using the _include parameter to specify the resources that it would like to be included in the returned bundle. (It could also get back just the Encounter and then make separate calls for all the referenced resources – but that’s a bit klutzy, and there are other problems that we’ll talk about in a minute). I’ve used the New Zealand situation for this discussion to demonstrate the process I used: the actual relationship of entities will be different in different realms of course (HL7 uses the term ‘realm’ to refer to different countries). A primary care centre is in the catchment area of a hospital (this needed an extension). So what does this look like on the wire? Well the snippet below shows a hospital encounter, with the resources within a bundle and appropriate references between resources for the (It’s not complete of course – in fact there’s just enough in there to allow it to validate). Now there’s actually an issue with this representation, and it relates to our old friend the resource identity. In this bundle all the resources are identified as ‘cid:’ references – meaning that they don’t refer to ‘real’ resources back on the server. (Because our back end is not fully FHIR enabled (yet), we’ve constructed the resources ‘on the fly’ from the data in the Encounter when the query was processed). But what should the recipient do with the bundle if it wanted to save it locally? It would need to create a new resource locally for each one in the bundle. What would happen if the client made 2 separate queries for encounters, and each encounter referred to the same patient? The client would have no way of knowing this, and so would create another resource for the same patient. This makes it explicit to the recipient that the contained resources only have meaning within the context of the containing Encounter. (And note that the contained resources no longer have a <text> element – the spec discourages this). As we progress with FHIR, we’ll be able to start to expose ‘real’ resources (with proper identities). For example, once we have a Patient resource endpoint available, then we won’t have to contain the Patient resource in the Encounter – it will be an ‘identifiable’ resource with a ‘real’ URL that points to it – and we can choose to include the resource in the bundle or not. This does mean that the representation will change over time with resources moving from being contained to being ‘real’ resources in their own right, but that’s something that comes with being a FHIR client. Of course this interface is actually more complex than the one it replaced, and it will take more work server-side to produce it that the previous custom version did. Where there was a single ‘object’ representing the encounter, we now have an object graph. But – and it is an important but – our interface can be used by any FHIR compliant system, which means that we can support – and promote – an international ecosystem of health information exchange. Further, much of the complexity can be hidden behind libraries that are freely available (or we can write our own if we want to). It’s clean and easy to understand. And, finally, we have a design than has been created by some of the smartest minds in healthcare IT – and it didn’t cost us anything! Rene Spronk has been active with his video at most of the FHIR connectathons, and has uploaded the videos here. There are also a number of interviews with various people involved in this work. Well worth a look! One thing that comes up frequently for people new to FHIR is the concept of a resource identity – and I have a great deal of sympathy with this as I also had a lot of trouble getting my head around exactly what this is. The identity of a resource is one of the fundamental concepts in REST – and in FHIR. In fact the way that you refer to a resource is via its URI – the Uniform Resource Identifier. It is a way of unambiguously locating or specifying the resource: if you have the URI then you can find and refer to it – for example being able to state unambiguously to which patient a particular condition refers. What seems to trip people up in healthcare is the similar business concept of a patient identifier, like a Medical Record Number (MRN) or in New Zealand the National Health Identifier (NHI) and which is often called a patient ID. Despite the similar sounding (identical!) names, they are quite different. The resource ID refers to the location of a resource (any resource) on a particular server (or at least the ‘external address’ – it’s up to the server where and how it’s physically stored, but it does agree to always refer to that resource from that place). Further, the resource ID is unique only on that server – it’s not transportable between servers. The MRN is actually an identifier from a registry/system of some sort – and identifies the person/patient for the business purpose of healthcare delivery. In healthcare, this functionality is often supplied by a ‘Master Patient Index’ (MPI) that has all sorts of sophisticated algorithms to help to resolve issues like two identifiers referring to the same person. The resource ID (specific to a server) that every resource MUST have. If a copy of the same ‘thing’ is stored on different servers, then they will have different IDs, but the ID will never change on a given server. It’s kind of like a primary key in a database – except that the primary key will change if a record is migrated to another database, which means that the location on that server would change, which means that it is no longer the same resource. A sequential counter or GUID that doesn’t change and stays with the record might be a better choice. The resource ID is not a property of the resource – it is held outside of it. A specific resource (like Patient) CAN have one or more identifier properties that refer to some external system or registry. FHIR doesn’t have any particular requirements of an identifier, only that you can specify the ‘system’ within which the identifier is unique – eg a passport, or a drivers license are equally valid identifiers. And, an identifier can change for a given resource. Another way to think of the difference is that the resource ID is a ‘system’ level ID – it locates resources and allows one resource to reference another. Change the ID and it becomes a different resource. An identifier is about how humans categorize things – including other humans – and can change. When a resource is copied from one server to another (maybe it is in a bundle, and the recipient server wants its own copy), then it will receive a new ID on the new server and so is a different resource (there is a different URI that refers to it). However, if there is an identifier property on the resource, then that will remain the same so a consumer of the resources will know that they are actually pointing to the same real world entity – eg a patient. There is more discussion on resource identity in the spec here, and about the identifier here. And I’ve talked before in this blog about REST in general, and using the ID to manipulate resources. Just a short post to point out a ‘quirk’ in the FHIR syntax for querying so I can look it up again when I forget. (actually, it’s not really a quirk at all – it’s perfectly reasonable, though can be confusing). It all came about when Josh pointed out an error in my post on retrieving documentReference resources from an server.